We have finally put our down-filled jackets away, for every now and then we can trade them for sunscreen. Almost every horse is completely shed out and the bull frogs have returned for their Summer concert series. A parent recently looked quizzically over to the pond and asked me, “Do you have a cow?” Knowing how much I love animals, that is a legitimate question. The truth is I have a few bull frogs. I guess we know where they got their name. We have had a busy, busy May- Give Big was successful, though not as much as we have seen in the past. We received around $6,000, which is wonderful! I am so grateful to all who gave at that event. The amount that the Seattle Foundation adds to it is not yet in, so we are praying for a boost! I am hoping that everyone is saving up their dollars to buy some tremendous trips and experiences at our annual Grand Event, “Journey to New Heights” which will be held on October 14, 2017 at the beautiful Chateau Ste. Michelle Winery in Woodinville, Washington. As we are planning it, I am getting more and more excited about the evening. It will be fun, informative, exciting and… Well, you just have to be there! Please SAVE THE DATE—OCTOBER 14. For those of you who have children of your own, kids who have not had trauma, it might be difficult to imagine a 13 year old girl who has lived such a traumatic life that she never smiles. I don’t know if she is afraid to get her hopes up that there might be something to enjoy, or is it the fear and challenge of mere survival that dominates her mind day and night that dampens any sunshine trying to creep into that dark place? I am not sure, but it something that I see all too often. That is when my horse counselor crew steps in to help. “Ruth” means grace and friendship. That is surely the case for our beloved Fjord, Ruthie. She is calm and gentle for those kids who have so much fear and confusion. She is often called “cuddly” by those who know her. To the kids who need her motherly steadiness, she waits patiently as they braid her forelock. She leans her big face into their chest, holding their hearts in the only way a 1200 pound “mom” can. I have often said that I get “paid” in smiles. Those smiles come when Ruthie’s gentle spirit and kind heart embrace those young and old who come into her life. I recall that the first word to describe love in 1 Corinthians 13 is “Love is patient…” We could all learn something from our beloved Ruthie. We had a fun t-shirt campaign that netted us several hundred dollars. It is so much fun to wear a shirt reading, “I support a 1200 pound therapist.” If you missed the campaign, contact the office as we ordered a few extra shirts that might fit you. It is quite a conversation starter :). We are launching a new project to serve more people: We are going to begin serving Military veterans and First Responders. If there is someone in your life that fits that description, please let them know that we are doing a few pilot trials of this new program. We have also selected a handful of our parents, who we know need some extra support and help, to join us for an ongoing group we call “Parent Keys to Relationship.” We will have the same 8 people meet once a month to experience the same therapeutic methodology that we do during our workshops. The participants in those workshops have called the experience “life-changing!” I feel this is the very best way to help the parents who are trying to sort through so much with these hurting kids. 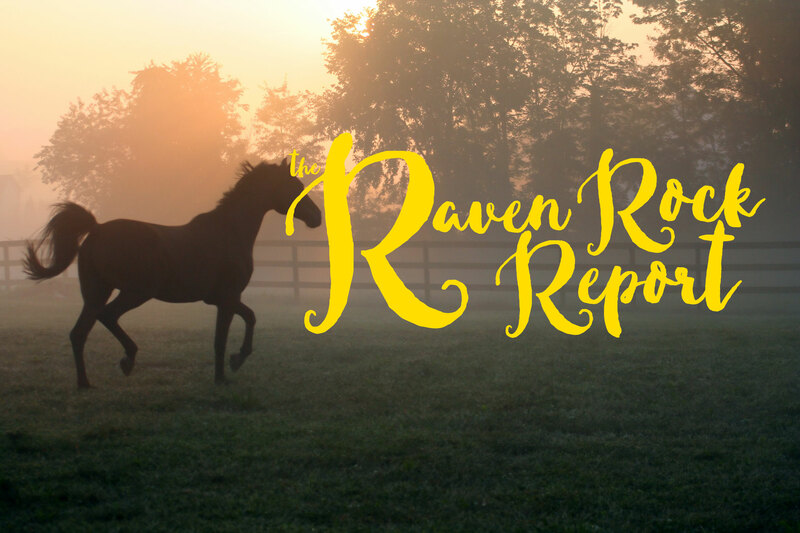 Raven Rock is thriving and changing lives one at a time. We are proud to have 5 of our kids graduating from High School this year! That is huge, as many of them were not expected to go to school, and certainly not graduate! Some are even going on to college. We wish them luck and give them the knowledge that they can always come back to this “anchor” place in their lives. We are not going any place thanks to all of our faithful supporters who give month after month, year after year, never forgetting that it is only through their generous gifting to RRR that we can do the important work that we do. We had a little party for graduates. Thanks to all who work, volunteer, donate, and pray for Raven Rock. And thanks to all who read this report:). With blessings and warm wishes to all!